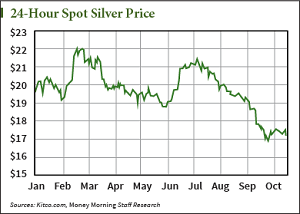 Jim Bach: The price of silver this week is down slightly – but the month’s performance has been a welcome change. Silver’s up $0.02 on the month. October has seen panicked markets and light short covering boost silver prices slightly. This is a nice shift from the weeks of unmitigated decline in silver prices. September saw the price of silver plunge 13%, after a 4.5% decline in August. Silver traded at $17.195 an ounce at yesterday’s (Thursday) close. This is up about $0.03 from the day before, but down a disappointing $0.31 from Monday’s close. This is also down $0.075 on the week, or 0.4%. So what are the biggest factors affecting silver now, and in the coming week? Precious metals can get a bounce from safe haven demand as panicked investors flock to real assets, fearing a market crash. In the last month the talks of crashes and corrections were deafening. That’s because the Dow Jones Industrial Average, having come off its Sept. 19 record high of 17,279.74 charted a volatile course from then on out. The Dow strung together five straight days of triple digit movements in both directions. The first biggest hit came on Sept. 25 when the leading market indicator plunged 264 points. This was the Dow’s fate for most of the month, up-and-downs eventually turned into a full-on descent. A 335-point drop on Oct. 9 precipitated an even deeper slump that resulted in the Dow wiping out all its gains on the year. Last Thursday, the Dow was trading at 16,117.24. This was down from the 2013 close of 16,576.66. At this level, the Dow had fallen about 7%. Not quite the 10% needed to fit the formal definition of a “correction,” but a sizable downdraft nonetheless. This was great for silver though. Declining markets do play into silver’s value on safe-haven investing. Since then, however, silver has slipped again. For most of the month it’s mimicked the violent, unpredictable movements of the Dow. And the Dow has begun to recover much of its losses this week, trading back at above the 16,700 level. So what does this mean for silver? While the market seems to be in slight recovery, it’s important to remember that it’s still volatile. We are not out of the woods yet just because the Dow has posted a few gains. Fear of a deadly Ebola outbreak have hardly subsided despite positive news that two of the nurses afflicted with the virus after tending to a Liberian traveler were cured of the disease this week. And the ineffective U.S.-led bombing campaign against the Islamic State has fallen far short of “degrading” or “destroying” the militant Islamic group in a way that will keep markets calm in the longer run. Global growth concerns and troubles in the Eurozone aren’t helping either. We’re still in the midst of troubling times for markets, and silver hasn’t lost its attractiveness as a hedging instrument. At this point, traders just seem uncertain. They don’t yet seem convinced that the 2014 market rally is resurrecting itself, or if the confluence of negative factors is going to spark a later, much deeper correction. You can see this uncertainty in the silver futures markets, which have been pretty consistent the whole year. Speculators would short silver on a weekly basis until the number of contracts built to a peak. All that short-side speculation pushed silver prices down. But as soon as a larger number of buyers saw silver trading at a discount, buyers would overwhelm the short sellers. And as prices moved up, they would get an added pop from short sellers looking to capture gains at low prices or close out their positions before a sustained rally wiped out all the value of their shorts. From late February to early June, traders increased their holdings of physical silver short from about 80 million ounces to a new record high of 245 million ounces. Silver prices fell from their yearly high of $21.965 to a new low of $18.76 in that time. But as that new peak was reached, buyers got in at cheap prices and squeezed out the short sellers. Short contracts began to fall and a silver rally propelled prices to $21.445 by July 11. And once again the pattern began repeating itself. From a 15-month low level of speculator shorting, to a new record peak of 257 million ounces short reached on Sept. 30, silver prices fell to new lows of $16.855. A sustained period of short covering would no doubt boost silver prices big time. But there is little evidence to suggest that is happening right now. From peak shorting of 257 million ounces on Sept. 30, speculators shed about 12.3 million ounces only to add another 5.4 million ounces the next week. This has kept silver in a state of flux. Prices are above the low reached earlier this month, but aren’t exactly chugging along. But with the Fed meeting next week, continued Ebola fears, and geopolitical unrest, silver will reestablish another rally in coming weeks.